Season the lamb and mix with the ground coriander and cumin. Shape into 30 meatballs. 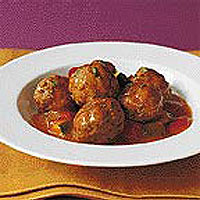 Heat the oil in a frying pan and fry the meatballs on all sides for 5 minutes, until browned. Transfer the meatballs to a saucepan and add the soup. Bring to the boil and simmer for 10 minutes or until lamb is cooked throughout. Season then stir in the chopped coriander.